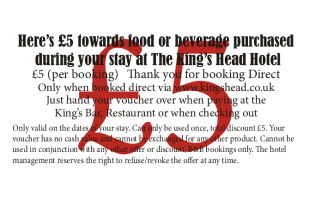 The Kings Head is on the High Street, which is a narrow one-way road, we are located just after the Market Building and before St Mary Street. Approach Ross on Wye from the A40 at Hildersley. Drive past the Chase Hotel on the left along Gloucester Road, at the Market Building drive straight ahead behind the Market Building and up the High Street. The Hotel is on the right with our car park entrance 50 yards further on. Approach Ross on Wye from the Wilton roundabout (where the A40 and A49 meet) Drive along Wilton Road over the old stone bridge. Turn right up the narrow St Mary Street, drive past the Royal Hotel. At the junction with High Street, our car-park entrance will be facing you just to the right. Drive carefully across the road, through the arch, in-between Harrison Clark Solicitors and Rossiter Books, Lloyds Bank is on your left. We have a secure car park at the rear of the hotel accessable via a archway situatied just past to hotel entrance.